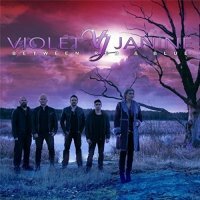 Violet Janine are a new Swedish (naturally!) AOR/Melodic Rock outfit. Now that in itself should be enough for you to consider buying this release. However, they also are one of the most exciting new acts I've heard in quite some time. With an album that is full of captivating and hook-laden songs, VJ are going to set a few hearts fluttering when they finally get to hear this release. Comprising the talents of Janine Nyman, Palle Hammarlund, Daniel Palmqvist, Basse Blyberg and Ian Brunnberg, the band have recorded nine of the strongest and most exhilarating AOR songs that it's been my pleasure to listen to this year. A revving motorcycle engine sets the everything rolling and from this ballsy start, you're then treated to some of the most infectious songs your likely to encounter in 2016. 'Heat On The Highway', 'Devil In Me', 'Tell Me', 'Everyday's A Fight' and 'Shut Up' charge out of the starting gate with unbridled gusto and hit you head on, driving their memorable choruses deep into your soul. In addition, there's the stunning duet 'So Much More', featuring legendary Black Sabbath/solo artist Tony Martin. It's a mid-paced Bluesy Rocker which shows the range and depth of Nyman's voice as she complements those whisky-soaked vocals of Martin. 'Better This Than Nothing' and 'Story Of My Life' follow; 'Better...' is an attitude-filled Rocker full of great musicianship whilst 'Story...' is a stunning ballad that really shows just what this band are truly capable of. Finally, we come to what is fast becoming my favourite song of the year, the absolutely jaw-droopingly good 'Down On My Knees'. This song is why I love Rock music so much. It's powerful, fun and just makes you happy when you listen to it and I've listened to it a lot. Again it's a duet with Nyman but this time joined by Pontus Snibb of Bonafide and it's the way their voices combine and the sheer joy that the band wring from every note that makes this song so, so special. How to sum this album and it's music is easy – one word easy... wow!